Forewarning: Sometimes as a mom you will feel unappreciated. ​We want to make sure you know how appreciated you are, always. Thank you for making us feel exactly the same. "As a first time mother, my worries got the best of me in every aspect. In Debra's yoga class, Debra introduced me to Baby Belly Tunes. Baby Belly Tunes is wonderful! The ability to listen to the same music that my baby is listening to is the coolest feature! There is an adapter that has speakers to the baby while I can plug in my earphones and listen too. This wrap came with everything! I did not need to go out and buy anything additional. What a way to connect to your unborn baby! The wrap is soft and supportive and with (a bit more junk in the trunk) I was nervous about it laying right on my back, but it was perfect. I like that I will be able to use it postpartum as well. If you are looking for a way to relax and connect to your baby (who isn't?) this product is for you!" - Selah D.
"The support of the wrap is great and super comfortable! Baby Belly Tunes calms my twin girls with music and I couldn't be happier. I look forward to playing the same music after birth to continue my bond with my girls. Thanks, Debra for such a wonderful connection to my babies!" - Nancy M.
"When I was pregnant, my baby was breach. Debra offered Baby Belly Tunes and behold - my baby turned head down! No c-section needed. I did a home birth! Thank you, Debra and Baby Belly Tunes for helping me have the birth I always dreamed of!" - Maia B. "When I came to yoga class with back pain and pelvic pain. Though the yoga helped considerably, I needed support after long walks shopping in the mall preparing for baby’s arrival. Debra suggested that I try Baby Belly Tunes. The belt helped resolve the pain where I could continue through the afternoon. Not to mention, I had a demanding work schedule throughout my second trimester, which required me to travel. I started wearing the belt during everyday normal activities. I also played my playlist from Spotify and iTunes, which helped calm baby down and definitely relax me. Taking long walks was always a drag especially during third trimester, but now I look forward to my after work stroll. Thanks, Debra for creating such a needed, wonderful product!" - Tatiana C.
"Baby Belly Tunes is a great accessory! It is super comfortable to wear due to the soft material, and it was simply fantastic to be able to listen to the same music as my son. I wish I had this for my first born! I strongly believe that playing music to your baby during pregnancy is beneficial. Plus, it’s also a very relaxing thing to do for expectant mothers. It also gives a lot of support! It lifts my belly. It also has pockets to put my iPhone or iPod in. Did we mention it comes with earphones? How convenient! I recommend this product to all my friends who are pregnant now. Totally worth it!" - Erica D.
"It was delightful to take prenatal yoga classes with Debra. I loved stopping my busy life and taking time to contemplate my baby, our health, the reverence and the feelings of gratefulness. The prenatal yoga helped me to be more peaceful and trust my body more! I didn't think I needed the Baby Belly Tunes wrap being so early in my pregnancy, but boy was I wrong! Once I purchased the Baby Belly Tunes support wrap, my entire pregnancy experience changed. It helped ease my hip pain and enjoy my belly more. Debra is a beautiful lady inside and out. She is definitely aware and present and she is so insightful in so many different areas of this world of pregnancy and babies. I definitely recommend her classes to the parents who want to be more educated and knowledgeable about birth." - Sabrina G.
"Thank you all for a truly inspirational workshop! What a beautiful circle of authentic, joyful and wise women. I love my Baby Belly Tunes wrap! The last few weeks of pregnancy have been so difficult but the belt helps tremendously. All the pressure in my spine seems to be magically lifted. Thanks so much for your enthusiasm and spontaneity to help me along. You are all so primal and powerful, and I am honored to be in your circle! A special thanks to you Debra for hosting us at Prenatal Plus Yoga." - Natalie M.
"This AMAZING product Baby Belly Tunes helped to turn my breech baby back to head down position! You could tell that Sofia was enjoying the music and we also recorded some messages for her to hear our voices. It is very comfortable and offers great back support! Not only is it wonderful to wear and use throughout the pregnancy but you can also use it once the baby is born. My partner was able to use the self adhesive speakers on the crib or stroller. A must have!" - McKayla B. 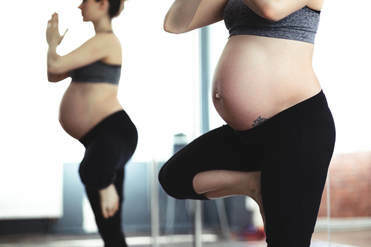 "Baby Belly Tunes + Prenatal Plus Yoga is the best thing you can do while pregnant. This place is amazing. SMART mommies-to-be come here! Debra is so informative and helpful is so many ways. The Baby Belly Tunes support is great and the wrap is super comfortable. While I was pregnant (in the photo) I could tell the music definitely calmed my baby boy. It also helped me feel closer to him and create a sense of connection. Debra also was great at teaching moms-to-be and help them achieve the most of what YOU want for your baby and labor/delivery expectations. We talked about all kinds of “the all natural” options. In addition to weekly prenatal yoga I also did the hypnobirthing session here. They were great and I highly recommend them. One all natural, birth center delivered baby later and I attribute my encouragement and initial awareness to Debra, Prenatal Plus Yoga, and especially Baby Belly Tunes. Try this product out! You won't be disappointed!" - Erika A. *Identities were hidden of certain women with changing of photos. All names remain the same.